l Solur, Tamil Nadu, May 1983. Investigations reveal that tanneries in nearby Ambur town have been releasing acidic waste into the river Palar, making the water toxic and unfit for drinking. l Bhopal, December 2, 1984. Methyl isocyanate leaks out of containers in the Union Carbide factory. Many die, thousands affected . l Delhi, December 4, 1985. Oleum gas leaks out of a factory owned by Sriram Foods and Fertilizers . Several people affected . THESE are now well-known cases. But the story of Dhoraji town in Rajkot district, Gujarat, goes back further. The residents began agitating against pollution of the river Bhadar, their source of drinking water, in 1978. When public protests proved ineffective, they filed a petition. The case dragged on for 14 long years. On August 5, 1997, the citizens of Dhoraji won the case. The Gujarat High Court ordered the polluting units in Jetpur upstream of Dhoraji be shut down till effluent treatment plants were installed. A fine of Rs 1.25 crore was imposed on the industry. The government has recovered one-third of the amount, but the petitioners -- the victims of pollution -- have received nothing. In most cases where pollution or release of toxic substances by negligent industries has been established, compensation to the victims has been far from adequate. Lack of knowledge among the people is just one of the reasons. The residents of Dhoraji, for instance, are not even aware that they should receive compensation and how to go about getting it. Worse -- nor, clearly, do their lawyers. Some jurists point out that evaluation of ecological damage and the loss suffered by people is India is ad hoc and arbitrary. Says Rajiv Dhawan, noted Supreme Court lawyer: "There is absolutely no basis for quantification of compensation in India. " Intermediaries in 'the system' benefit and compensation rarely reaches the victims. But that is not all. The very basis on which court orders rest -- precedents, cases and the principles invoked in assessing environmental damage and awarding compensation -- is shaky. Where the river runs red On August 5, 1997, the Gujarat High Court ordered immediate closure of 1,200 sari dyeing and printing units in Jetpur. The industry in Jetpur is over 60 years' old and employs a workforce of over 30,000. There are some 500 allied industrial units, producing chemicals and dyes. These units have totally contaminated the river Bhadar and groundwater in the region. The court order appeared to be a victory for the citizens of Dhoraji, who could now expect clean potable water. But on September 8, 1997, the units were allowed to reopen on a petition pleading that the livelihood of over 30,000 persons was at stake. The reopening was subject to the condition that treatment plants be constructed and made operational, and that the industry pay a fine of Rs 1.25 crore. Perhaps the worst affected by the pollution in the region is Dhoraji, a town with a population of 80,000, mostly farmers and millers. Says a resident: "The industry has released chemicals that have turned the Bhadar and every reservoir, pond and well in this area crimson. The 90-km stretch along the river has become unusable for agriculture. Even the subsoil has been polluted -- handpumps throw up red water." Awareness of the effects of polluted water among the people of Dhoraji and in neighbouring villages spread in the 1970s. People staged protests in 1978. The government decided to construct a 16-km pipeline at a cost of Rs 72 lakh to supply potable water to Dhoraji from Phophad dam in neighbouring Jamkandorana taluka. But no funds were set aside -- the people were asked to pay for the project and Dhoraji Municipality was appointed as the implementing authority. As a result, it remained a paper project. In April 1983, two residents of Dhoraji -- Shamji Bhai Antala and B C Patel (both agriculturists) -- filed a writ petition against the Jetpur industry, the Dhoraji municipality and the state government in the Gujarat High Court. The court ordered the municipality to complete the project. The pipeline from Phophad dam was laid at a cost of Rs 1.22 crore. But the citizens were aghast to find that tap water supplied was still red. On inquiry, it was found that the quality of the pipeline was so poor that it developed a huge leak at the point where it crossed the Bhadar underground. The clean water was again contaminated. While the government pressurised the industry to set up joint treatment plants before releasing effluents into the Bhadar, only some units complied. No action was taken against the defaulting units by the district collector, except issuing notices from time to time. The government ignored the high court notice to file an affidavit in response to the petition till a division bench issued a directive in 1995. Says Jagdish Chandra, chief officer, Dhoraji municipality: "During the period, more than a dozen tests were carried out by the Gujarat Pollution Control Board (gpcb) on samples of water supplied to Dhoraji. Each time the report said that the water was unfit for human or animal consumption." Says Manhar Patel, paediatrician and president of the local Red Cross Society: "The medical reports, too, were in favour of the petitioners." The division bench issued strictures against the government and its agencies, including the gpcb , and the printing industry. On July 31, 1995, it ordered closure of defaulting units till they complied with the order to set up operational treatment plants. But the rich and influential industry (turnover: Rs 150 crore) had its way. Promising to set up the proposed treatment plants, it secured permission from the government to continue operations. Moreover, 500 new units were cleared by the gpcb , blatantly ignoring the directives of the government and the court. Finally, the high court intervened on August 5, 1997, ordering unconditional closure of all units forthwith. The orders were explicit. The locks were to be opened only if the units contribute to an environment fund (one per cent of their annual turnover) and chose a proper site for water purification. But the people are still not sure whether they will get justice -- clean water, the reward of their struggle, and compensation for their ailments and suffering. Says Patel, "Twenty years is a long time. We are tired now. We have not thought of compensation. That is not important -- all we want is clean water to drink. We have been told that we might get 10 per cent of the fine amount. But that cannot compensate for all the years of consuming contaminated water. How will this money help in cleaning up the river, which may take over 100 years to regenerate?" 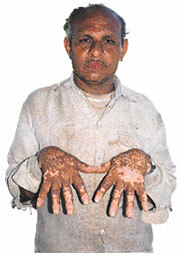 Many residents of Dhoraji suffer from skin diseases. Cases of cancer are said to be on the rise. Vittalbhai, 40, a farmer, shows his hands that have turned black, the skin peeling off. "This is what the chemicals meant to me." Lacking a law, personal harm or suffering as a result of damage to the environment is difficult to prove. Says Raj Panjwani, a Delhi High Court lawyer: "Until recently, industrial workers have been covered by the Fatal Accidents Act of 1855. Employees and the general population not covered under this act were covered under the general law. Even under this act, damages could be claimed only with respect to physical harm of the person and not his surroundings." In the Sriram Foods and Fertilizer case, the Supreme Court (sc) laid down a new principle of liability to deal with hazardous or inherently dangerous industries. It said that an industry engaging in an activity that poses a potential threat to the health and safety of the persons working in the factory and residing in surrounding areas owes an absolute and non-delegable duty to the community to ensure that no harm results to any one on account...of the activity." It said that the enterprise "must be absolutely liable " to compensate for harm resulting from such activity, and that the enterprise cannot argue that it had taken "all reasonable care and that the harm occurred without any negligence on its part" (emphases added). This principle was used in the Public Liability Insurance Act (plia), 1991, which provides for immediate relief to people affected by industrial accidents. Another step was taken by the sc in the Bhopal gas disaster litigation. In a compensation case (Charan Lal Sahu versus Union of India), the court ruled that since long-drawn litigations destroy "the very purpose of awarding damages", a law should be enacted by Parliament, providing for the setting up of a tribunal with a special procedure for determining compensation to the victims. Some time back, a decision to this effect was taken. But the new law, as Shyam Diwan, a Bombay-based lawyer points out, "has yet to come into force". While the National Environmental Tribunal Act (neta), 1995, had provided for the establishment for the National Environment Tribunal, it has also not started functioning yet. Evaluating damage remains a big problem. Says Prashant Bhushan, a Delhi-based lawyer: "In countries such as the us and the uk , laws and principles of compensation have been developed by the courts themselves" (see boxes: Clean-up acts and Bitter pill for the polluter ). But this has not happened in India. J P Pathak, a Supreme Court lawyer, points out that Britain has a long history of judicial interference and principles of quantification. "Under the existing laws in India, penalties are imposed, but liability is not calculated." Neither plia nor neta have laid down principles for quantification of damage and compensation. In the us , means have been evolved to quantify even trauma. "The main problem in our country is that the people are poor and the courts are manned by elitists. They don't place much value on the cost of treatment, the pain, suffering and loss of wages," says Bhushan (see table: Biased against the poor) . In the Tamil Nadu tanneries case (Vellore Citizens Welfare Forum vs Union of India, 1996), the court fined each tannery found responsible for polluting the river Palar Rs 10,000. The money was to be utilised for providing compensation and restoring the environment. According to Paul Baskar of the Justice Bhagwati Environmental Development Institute (bedi), which conducted an economic analysis of the environmental damage in the case, the fine amount was arrived at 'arbitrarily'. The industrialists bargained strongly for this amount, and it was agreed on, he says. Calculations made by organisations appointed by courts to assess the damage, like the Nagpur-based National Environmental Engineering Research Institute (neeri), are not accurate either. In the Bichchri case, the annual cost of remedies recommen-ded by neeri was Rs 37.3 crore and the villagers were to be paid a compensation of Rs 3.4 crore. Environmental experts question this calculation. R L Siddiqui of Aligarh Muslim University has termed the amount "highly impractical" on technical grounds. In the Span Resorts case (M C Mehta vs Kamal Nath and others, 1996) the sc directed Span Motels Pvt Ltd to pay a damage for environmental degradation and causing flooding of the river Beas near Manali because of its construction activities. It asked neeri and the Central Pollution Control Board to assess the damage, which was calculated to be Rs 4.645 crore. Calling the neeri report "incomprehensible", Span Resorts representative B L Mathur says the company has not yet been told how much to pay and to whom. But as Supreme Court lawyer Murli Dhar points out, "Money is not always the solution. It may even create problems for the victim. A person who receives compensation money may become alienated from his community. This is happening in Bhopal. The judiciary needs to use more imagination (in such cases)." Justice Kuldip Singh, however, defends the judiciary. "There is no arithmetic in justice. Keeping in view the extent of the damage, we have to apply some judicial discretion." Says Panjwani: "Damages which are imposed to set an example or to deter others have not as yet evolved satisfactorily. What is usually awarded is the actual amount for damages incurred." Richard Macrory, professor at the Imperial College Centre for Environmental Technology, London, points out that while "it is dangerous to look at civil liability as a tool to get funds for cleaning up the environment, it is most useful in controlling future behaviour." In the Tamil Nadu tanneries case the state government constituted the Tamil Nadu Ecological Authority (tnea) to look into claims for compensation and damages. But the tnea has yet to become functional. "In the meantime, most of the tanneries have started operating again," says Baskar. The tnea , on the other hand, says it cannot function without infrastructure. "We have not been provided with office space or staff, and the ministry of environment and forests (mef) has not yet decided upon our remuneration," said B B Sundaresan, a member of tnea and former vice-chancellor of Madras University. In the Bichchri case, the court directed the industry to finance improvement and restoration of the environment in the area. The respondents were given six weeks to submit an explanation to the mef . The ministry, which had 12 weeks to determine environmental damage in Bichchri, has not made any progress beyond sending a notice to the industries. Not a paisa has been paid as compensation to the villagers. Says Manna Ram Dangi, a local advocate in Bichchri: "There are no signs that the people will be compensated for the damages. We have formed a local organisation to file civil suits for claims, but the mef has not taken any action." The mef is tight-lipped on the matter. When contacted by Down To Earth , additional director in the mef Indrani Mukherji simply refused to comment. Says Delhi-based lawyer Sanjay Ghosh: "There is no mechanism for enforcement of court orders. In the uk and Australia, a special unit within the government departments concerned looks after these issues." Adds Bhushan: "In Germany and other European countries the procedure is very quick -- it sometimes does not even require lawyers." Former chief justice of India P N Bhagwati avers that environmental litigation is new in India. "Often, our courts do not have adequate support to handle such technically complex issues," he says. But legal action to ensure proer follow-up of court orders and political will is lacking. "The courts just pass the buck to the state or Union government," says Murli Dhar. Environmental lawyer M C Mehta says that in the Bichchri case the state government should have paid compensation to the villagers on the basis of the district administration's earlier assessment, amounting to Rs 12 lakh. But Mehta himself did precious little to ensure that compensation was awarded, which shows that even lawyers do not give much importance to the issue. The slow distribution of compensation in the Bhopal case by the state government means that it would take at least 13 years to clear the over 600,000 claims. Many of the victims would be dead by then. Environmental awareness in India is low. Compensation laws have not evolved. The judiciary and the government have yet to set up a system to assess the liability of a polluter and award compensation to the victims of environmental accidents. 'Environmental authorities' are bogged down by lack of infrastructure and the authority to act on their own. Add to that the might of money that large companies wield. As Prashant Bhushan says: "The victims are poor and the company is rich. The poor don't have the money to file compensation claims, while the company has all the resources to disclaim them." This can be easily seen in a comparison of the compensation paid by Union Carbide India Ltd to victims of the Bhopal gas disaster and Union Carbide and other corporations in other cases in the US. Does this mean that the situation is hopeless? Not necessarily. Justice Kuldip Singh, for one, is optimistic. "At least we have started awarding compensation, howsoever late." But there is not much to share Singh's optimism. Environmental law in other countries can provide a framework for developing laws in India.